Goalkeeper: No decision for van Gaal to make here. Victor Valdes is a decent back-up but David De Gea is certain to start in goal tomorrow. Defence: Luke Shaw is back in contention after missing Wednesday’s 1-0 win over Newcastle with a minor hamstring complaint. 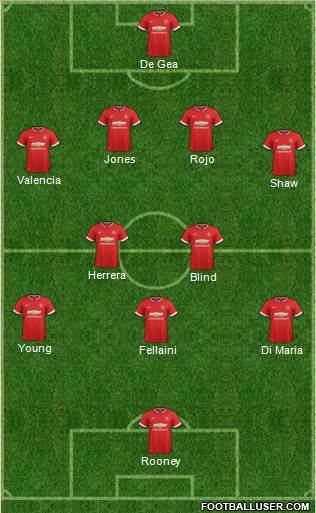 If van Gaal recalls the youngster then Marcos Rojo should move back into the center of defence. Phil Jones could also be set for a recall in place of the suspended Jonny Evans – who starts a six-game ban for spiting. Rafael remains out of favour so Antonio Valencia should retain his place at right back. Midfield: Michael Carrick came on as a late substitute at St James’ Park but van Gaal has confirmed he’s still not fit enough to start, so Daley Blind will continue in the holding role in midfield. Ander Herrera appears to have played his way into van Gaal’s first team plans in recent games so he could continue in midfield while Marouane Fellaini may also retain his place. Ashley Young scored a late winner last time out so should continue in attack while Angel Di Maria is expected to keep his place despite some disappointing form lately. Attack: Robin van Persie is still out with an ankle injury so Wayne Rooney is expected to lead the line with Radamel Falcao clearly out-of-favour at the minute. What do you think? What team would you select for the game?